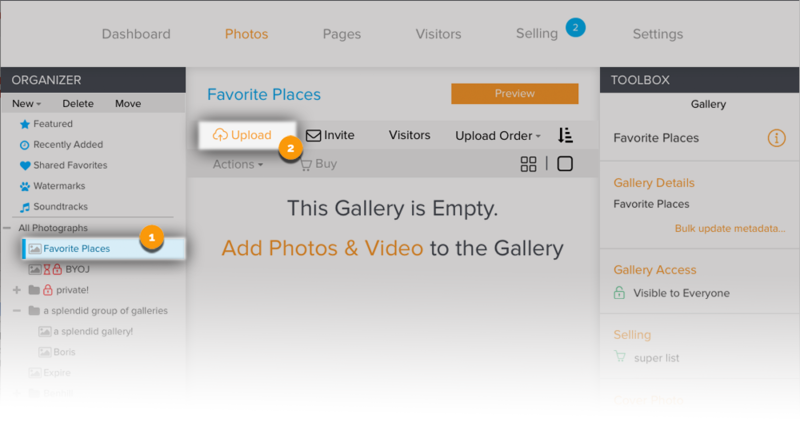 There are many options for uploading photos and video to your Zenfolio account. Using any supported browser, you may upload photos and video into a Gallery, made for displaying your work. Using Google Chrome, you may upload a directory of photos and video into a Group, such as All Photographs, made for organization. Using plug-ins to photo management applications, photos and video can be uploaded directly from your hard drive. 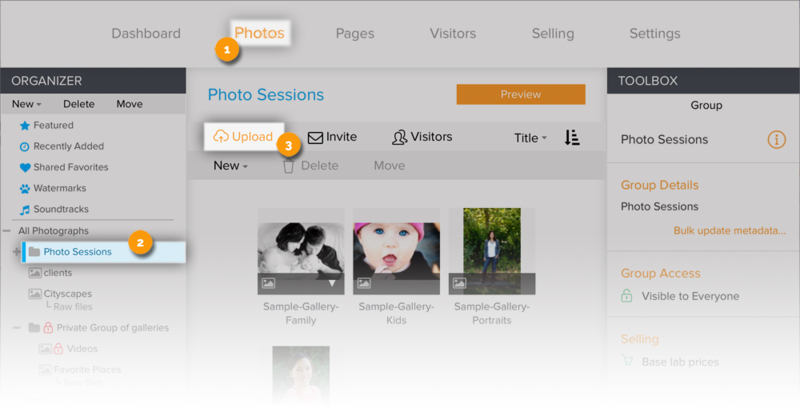 Using one of our mobile apps, you may transfer photos, and in some cases video, into your Zenfolio account. 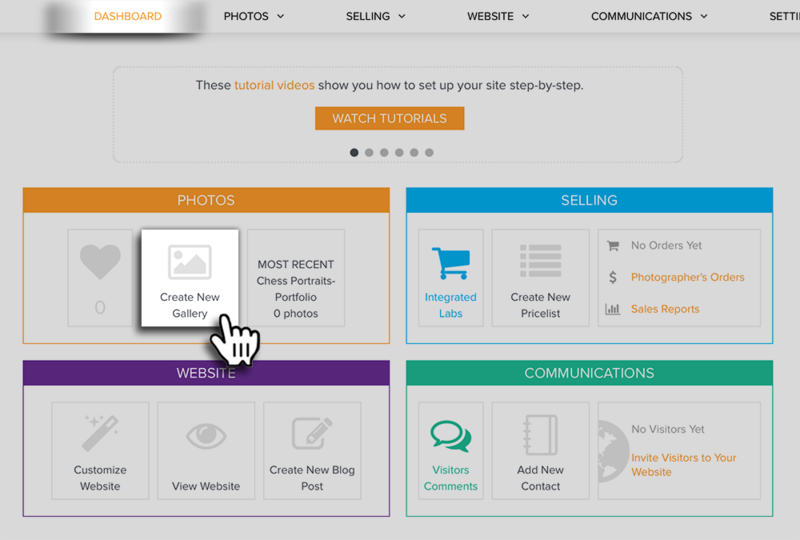 Use a third party program such as Blogstomp to upload the photos. Below you'll find the steps for uploading photos, video, and RAW files through a browser to a gallery or group. Please see the Resources section of our website for more information on using plug-ins, mobile apps, and migration tools. Please note that no FTP access is available. Photos must be uploaded to the account using one of the above methods. Photos may be uploaded to a gallery through a browser. Before uploading photos, you may want to view our photo guidelines. 2GB of RAW image file storage is provided for free with each account. Any amount stored over the 2GB will incur an additional cost. Video may be uploaded to the same gallery as your photos. In order to upload video clips, they must meet the video guidelines specified. Video clips need to be compressed and converted for online viewing. Only the converted video files are stored in your account. We recommend that you save a local copy of your original video file. Video clips will not be available for viewing until the conversion process has been completed. Uploading through a web browser is optimized for uploading many files at once. ​In the Dashboard, you will see tiles that contain shortcuts to various sections of the account. In the Photos tile, click on Create New Gallery. A pop up window will appear. In the pop up window You will be prompted to give the new gallery a title along with the options to create a caption and keywords - then to click Next. You will then be able to choose where to place your new gallery. If no other Groups have yet been created the gallery will be placed in the top-level All Photographs group - then click Next. Next you can determine the accessibility of the gallery. You can choose to make the gallery Public, Password Protected, or Private (only visible to you while logged into your account). You can always change this by going to the Access Control settings. Open the folder in your computer that contains the images. While holding down the left mouse button, drag the files over the uploader browser window. When you see an orange highlight around the uploader box, release the mouse button and the files will drop inside the uploader. Click Upload to begin uploading. Depending on your internet connection speeds, then number of images being uploaded and the file size of each image, the upload may take a while. Please be patient. The Estimated Upload Time will countdown as the images are uploaded. Click Done to close the Upload window once you've completed the uploads. You can also see the above uploading steps displayed in this tutorial video. In the Dashboard, select the gallery in the Organizer where you want to upload your photos and video under All Photographs. In the Main Area click Upload Photos or Video under the gallery title in the Top Menu. The uploading tool will load automatically. 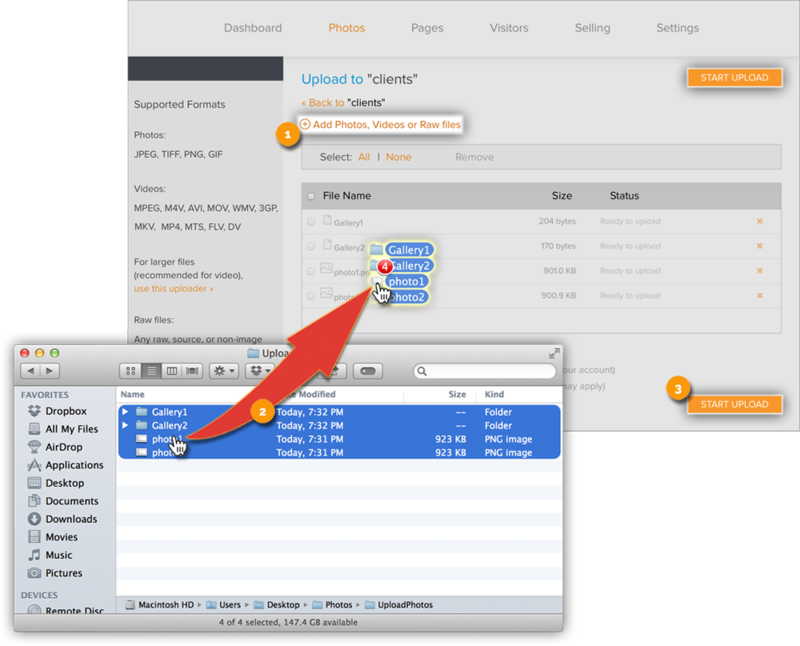 You can drag and drop files directly into the upload window. These screenshots will vary based on your web browser, operating system and operating system version. But the main steps will be similar across most platforms. Navigate to the desired files using your computer's File Manager. Highlight to select the files that are to be uploaded. While holding down the left mouse button, drag the files into the uploader window. When you see an orange highlight around the uploader box, release the mouse button and the files will drop inside the uploader. Repeat steps 1 to 2 to add more photos and video. Click Start Upload to begin uploading. Note: In the process of uploading, EXIF and IPTC data is transferred along with the photos. Video will still need to process before it can be viewed. Using Google Chrome you may upload directories of photos and video directly into a group. An uploaded directory with only photos and video inside will become a gallery. Any uploaded directory also containing subdirectories will become a group. The subdirectories will become galleries within the group. Photos within the main directory will be placed in a gallery within the group using the title of the group with "-photos" appended. Photos and video uploaded individually will be placed in a gallery using the title of the main group with "-photos" appended. Before uploading photos, you may want to view our photo guidelines. Video may also be uploaded to the same gallery as your photos. In order to upload video clips, they must meet the video guidelines specified. Video clips need to be compressed and converted for online viewing. Only the converted video files are stored in your account. We recommend that you save a local copy of your original video file. Video clips will not be available for viewing until the conversion process has been completed. Select a Group in the Organizer where you want to upload your directory of photos and video. This group may be the All Photographs group, or any group within. In the Main Area click Upload under the gallery title in the Top Menu. The uploading tool will load automatically. You can drag and drop directories directly into the upload window. These screenshots will vary based on your web browser, operating system and operating system version. But the main steps will be similar across most platforms. Navigate to the desired directory using your computer's File Manager. Highlight to select the files that are to be uploaded. While holding down the left mouse button, drag the directory into the uploader window. When you see an orange highlight around the uploader box, release the mouse button and the directory will drop inside the uploader as a Gallery, with the photos and video appearing below. Repeat steps 1 to 2 to add more directories.